Open Monday - Saturday 5pm-10pm | 512.321.2135 | 703 Chestnut, Bastrop, TX 78602 | Connect With Us! Tucked away right off of Main Street in downtown Bastrop, Piney Creek Chop House is the sophisticated Texan’s hideaway. Amid the historic district lies a truly classic and refined experience. The intimate bar and dining areas are a quiet reprieve from the day.  From the brick walls to piano bar to the outstanding and personable service, Piney Creek Chop House offers all the elegance of a big city steakhouse but with the comfort of home. With renowned appetizers and a filet you can slice with a butter knife, the menu is the perfect palette for a charming night on the town or to host the firm’s senior partners. It’s where one goes to leave a lasting impression. The entrance may be easy to walk past in the night, but those who find their way inside treasure the most exquisite dining experience in Bastrop.